Very little has been written about the Rheinsberg factory. The town of Rheinsberg is located in central Germany north of Berlin. It was started around 1762 under the direction of Johann Georg von Reisenitz. Its most known manager was Carl Friedrich Lűdicke, who after starting a factory in Berlin in 1756 left there and came to Rheinsberg around 1770. It is unknown when he left the factory. 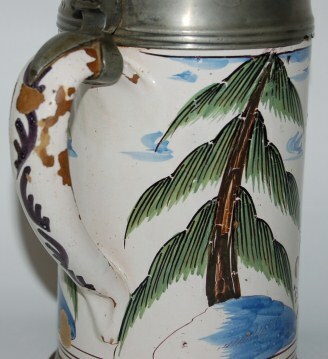 Rheinsberg faience steins do not come on the market very often as I only have 34 total steins for sale out of over 8300 that are in my faience stein sales database. 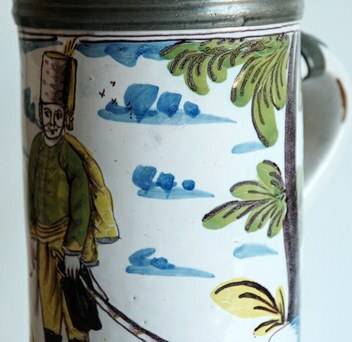 One of my reference books indicates that faience production may have stopped and stoneware production begun around 1787, which would mean that faience was only produced for 25 years and could be the reason for so few faience steins appearing on the market. 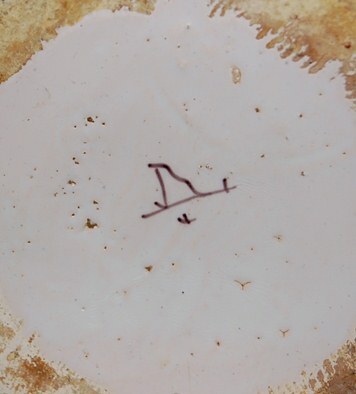 [FIG 1] STEIN BODY: Figure 1 shows a typical Rheinsberg stein. The body has straight sides at the bottom and the top is indented where the lid ring fits. 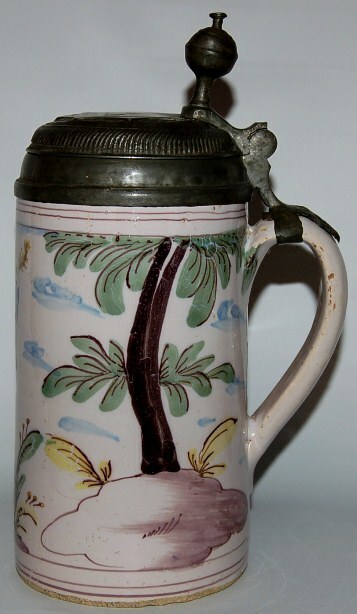 As you can see the pewter base is missing, which is typical for northern Germany faience steins. [ FIG 2] – STEIN HANDLE: A typical Rheinsberg handle is shown in Figure 2. The handle is tapered from top to bottom and has a cross-section of a D (flat on the inside and rounded on the outside). The top handle attachment flares out slightly while the bottom handle attachment has a rounded point and is pushed in in the middle, as can be seen in the photo. 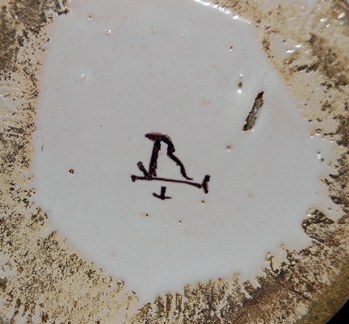 [FIG 3] – STEIN MARKS: Unusual for faience steins, most Rheinsberg steins that I have seen are marked. The usual mark is a joined RL, often with a + underneath; which is thought to stand for Rheinsberg-Lűdicke. Although some marks are very clear others are not. 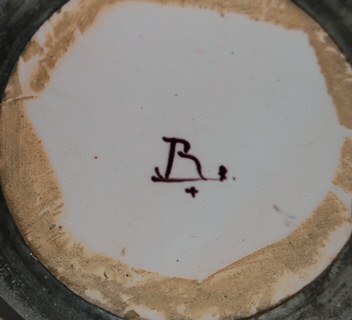 Often the RL can look like just an R and at other times it may not even appear to be an R. Figure 3 shows the 4 marks that are on the Rheinsberg steins that I own and shows the variations that appear in the marks. 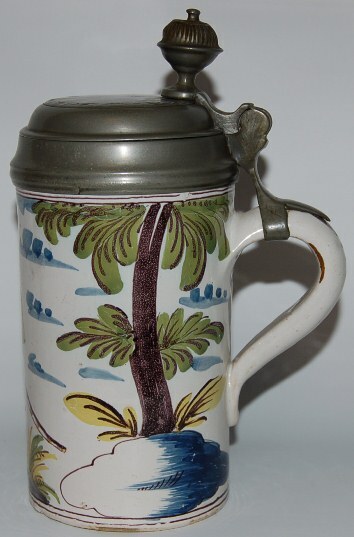 DECORATION: There are several decoration styles that also help to identify Rheinsberg stein, especially when you can’t see the handle design and maybe not even the bottom of the stein where it would be marked. 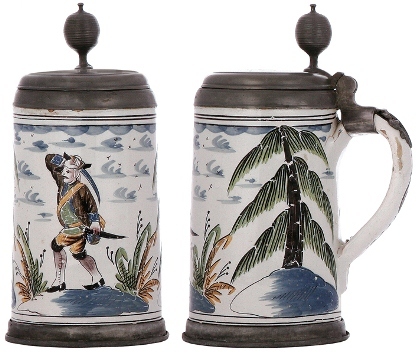 Most steins decorated with a figural theme have the figure in the center of the stein with grass/leafy decorations on either side of the figure (as can be seen in Figure 1). [FIG 4] – The cloud decoration seen in the background is also unique. They have two or three vertical brush strokes with one horizontal brush stroke underneath. Figure 4 shows a close up of the cloud decoration. The side decorations are often a tree that appears to be on an island. The island is usually only half colored in and the tree can be a palm tree or pine tree. When a palm tree, the tree has leaves at the top and the middle of the tree. Figure 5 and 5a [ABOVE] shows a typical side decoration with the palm tree. If you look at Figure 2, you can see the pine tree side decoration. PEWTER WORK: Some Rheinsberg steins have unique pewter work. Three of the four Rheinsberg steins that I own have this pewter work. 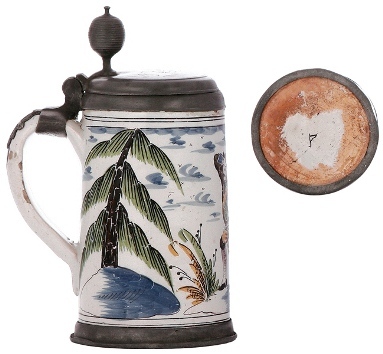 The pewter work is done by Michael Gottlieb Hardert of Stettin (Poland) and the unusual feature is that the bottom pewter is a ring rather than a full pewter base, which allows the mark on the bottom of the stein to show. The side of the base ring is straight to go with the straight side of the stein. 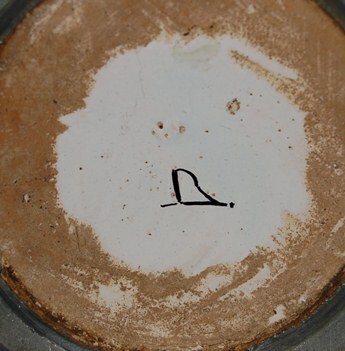 Figure 6 shows the pewter marks of this maker. Figure 7A AND 7 B shows a Rheinsberg stein sold by The Stein Auction Company (TSACO) at the 2010 SCI convention. It shows every decoration technique discussed in this article in one photo. A central figure with grass/leaves on either side, cloud decorations in the background, side decoration with pine tree on a half colored in island, and finally the mark on the bottom.